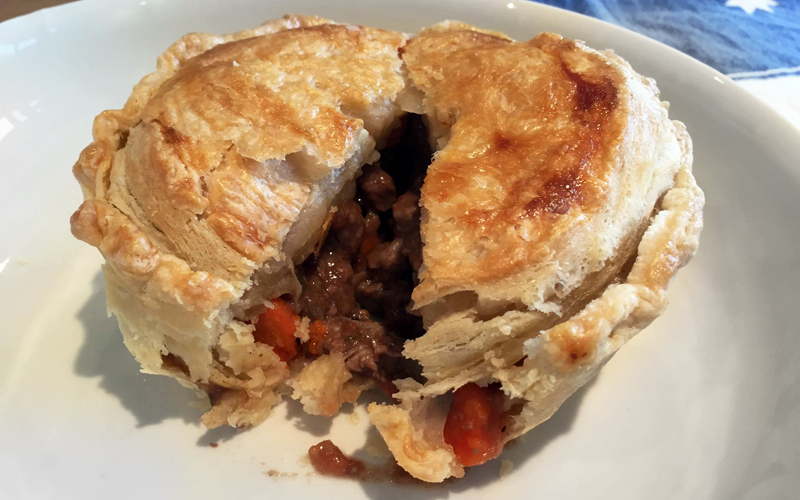 It’s not as easy as you might think to find the ultimate Aussie meat pie recipe, and to then merge it with other flavors to match the taste of the Royal Sydney Easter Agricultural Show top prizewinning meat pie from Mick’s Bakery I had in Sydney. That pie was soft, crunchy, peppery, yummy goodness filled with meat and gravy. It was unlike anything I’d had in the States. The crust was softer than that of a chicken potpie crust here. You could pop it out of its baking container and hold it in your hands, if you so chose. 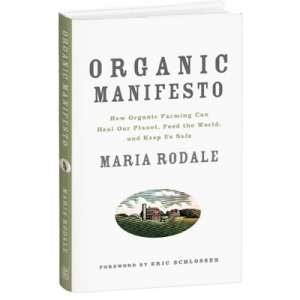 And THEN I remembered that we have a new employee at Rodale Inc. who doesn’t just hail from Australia, but had been with the World’s Best Food Magazine, Donna Hay! Fortunately, she’d just unpacked and was able to share the meat pie recipe from her favorite bakery in Sydney, Bourke Street. Thank you, Melanie Hansche! I also consulted my Australian friend Marg Haymanson, who sent me her favorite recipe—which gave me the idea to use the Worcestershire sauce. And yes, people, when I want something I do not settle for less until I get it! Marg also adds curry powder to her pies, which sounds good, too. The truth is you can stuff these pies with anything once you understand the basic recipe. Thank you, Marg! But wait! When I made the recipe from Bourke Street Bakery, the crusts were amazing (yes, there are two kinds of crust: a short crust for the base and puff pastry for the top), but the insides were still not quite right. Too many vegetables! Not enough black pepper! Too “gourmet”! Plus, the quantities were for, like, 12 pies, which is a lot—even for my two girls and me to tackle. Hence, I adapted everything to my own tastes and for smaller quantities. Because there are three separate recipes involved (filling, short crust, and puff pastry), I’m going to run the full recipe over three blogs. Part I will be for the filling and the basic pie process (if you can’t wait to make your own puff pastry, go out and buy some!). Next will come the puff pastry (Part II), and then the short crust (Part III). So, stay tuned! Place the olive oil and onion in a pot. Add the meat and brown it. Add water until it covers the meat by an inch or so. Bring to a boil and skim the scum off the top (sorry, but that’s what it looks like). Add the vinegar, Worcestershire sauce, salt, and pepper and cook on low for another hour or so. Remove the meat and let the broth thicken. Add the cornstarch mixed with a bit of water and stir in to thicken. Once the mixture is thickened, add the meat back in, and taste to see if you like it. If not, adapt to your own tastes! Set filling aside to cool. Then put your pies together and bake! Roll out the short crust and fill individual pie containers. Cut the puff pastry for the top. Use an egg wash (1 raw egg beaten with a bit of water) to glue the top and sides together and coat the top crust lightly. Poke a hole in the top crust so steam can escape. Bake for about 35 minutes! A final note: Do not attempt to eat these if you are allergic to gluten. They are a veritable gluten festival! I’m not even going to attempt to make these gluten-free, if you were wondering. Voting Is Open for the 2015 Real Food Media Contest Short Films! 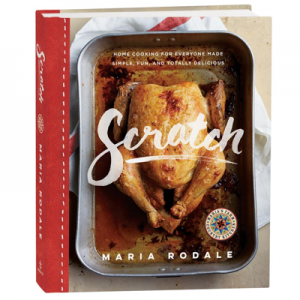 Thank you for this recipe Maria! I have seen many meat pie recipes in upscale food magazines, tried a few, and always ended up disappointed, ALWAYS!!!!! I am definitely going to try this one. Williams Sonoma sells great frozen puff pastry. When I need good puff pastry, and not the grocery store type, that’s my go-to place. It comes frozen and not available all year-round. It is made by a French chef, who makes other great products for Williams Sonoma. Needless to say that it isn’t cheap, but you get about 4 rolls of 17inch pastry dough. Another thing, I usually put catsup in my meat pies also. It does give it a certain something a nicer flavor, so-to-speak although I’ll take your word for it that it is not necessary in this recipe. It looks positively yummy for a cold winter’s day meal. This meat pie looks great and will try it without the wheat for something else. That in itself will be a challenge, but I have a few ideas. I am gluten intolerant, but can sneak in some wheat now and then, but now-a-days prefer not to. This new 2 foot high wheat may make the farmers and chemical companies happy, but the real problems is not just the gluten, but it is the gliden <sp; in the wheat that everyone should be afraid of. If you are into smaller brains, generation to generation, than gliden shouldn't be a problem. Studies have been done looking back to the early Egyptian's to present day humans. Also comparing that of the larger brains of Neanderthal's. Anyway, grains in general should be avoided, especially wheat. Somebody somewhere got the message, and it was nice to see it remove from the bottom of the food pyramid, (most eaten), to the top of the pyramid, (less eaten). I won't bore you with the new genes from this new wheat that may be effecting us down the line. Just something else to compete with our good stomach bacteria, as if GMO crop bacteria is not enough. Soy is tricky since it since it is high is estrogen and guys do not need estrogen, but we both (male and females humans) have x chromosomes and may look upon the soy bacteria as a friend, instead of a foe. I am sure Monsanto is well aware of this, but they are happy as long as they are selling their chemicals. I recently came across the Savory Pie Guy at a bar in Brooklyn where I’d get a pie, a pint and watch the Footy. Then I found out they’re sold in lots of markets across the NE. Great pies – certainly better than Pie Face (RIP) or the other unnamed pie guys. Thank you for making the puff pastry, so many recipes tell you buy manufactured food to make “homemade.” I always liked Stephen Schmidt’s recipes and which “kiddingly” a bread recipe would start with plant wheat. There is a easy puff pastry recipe in Nick Malgieri’s How To Bake book. Yes, many of my cookbooks are old, but I started cooking a long time ago. Thank you for real cooking! I can’t get the broth to thicken. Followed the method correctly. Help? My wife is an Australian and she loves it . Done it with sirloin tips and ground beef . Ground beef does best .